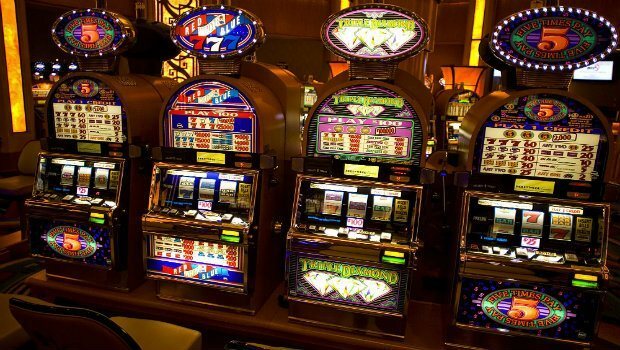 Online slot players will be familiar with the video slot format, if not the live environment, while casino regulars may find these isolated machines somewhat alienating and lacking the simple charm of their mechanical predecessors. In truth, slots remain as diverse, exciting, and frustrating as any other casino game. The advent of the microprocessor may have seen traditional, mechanical slots form a smaller and smaller part of real-life casino gaming as video slots took over, but that's no cause for alarm. One of the key reasons for the transition is that mechanical slots, for reasons of reliability and simplicity, were normally just three reels with a single win line. Statistically speaking, this massively reduces the number of potential outcomes on any given spin and, therefore, the size and frequency of wins that manufacturers could offer while still maintaining their edge. Following the arrival of electronic processors, manufacturers could keep the same number of symbols, but programme the frequency at which they landed. So although the machines looked the same, the odds were stacked to ensure the margins manufacturers wanted were achieved. Some of these are still in operation, and the good thing about playing these machines is that you can deploy the classic 'lurker' strategy. This frequently practised dark art involves looking out for someone on a losing streak and then, when they give up, you jump onto their 'full' machine with a greater chance of receiving a big payout. And for many players, this sneaky way of getting one over your rivals in the dog-eat-dog world of casinos is all part of the thrill. However, because video slots are computerised, the odds calculations are much more intricate, less reliant on cold coin circulation, and so freed from the tyranny of the lurker. Video slots are also five reels, with the option to stake your bet on anywhere between one and 25 (sometimes even more) win lines, which can be any designated patterns across the reels. But rather than waiting for the Lucky 7s to align, the video slot player is more likely looking for a series of special symbols to align and initiate the dazzling array of bonus games that are produced in ever-increasing quantity and quality. The extra excitement that comes with these video slots is the increased win rate. With so many lines in play, and such a range of staking options, the chances are you'll be winning at least some percentage of your stake back on most spins: so a poor run of luck won't always wipe you out so quickly. And with the lurker impotent in the background, the land-based casino environment transforms from a Darwinian battle into the kind of shared space for camaraderie and tip-sharing that you'd more readily associate with a friendly bookies. Plus, with many titles available to play in online and in-house casinos of big players like Gala Casino, you can swot up at home before a night of real-life gaming.